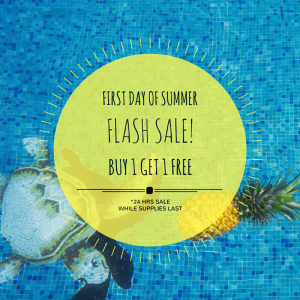 SAN DIEGO, CALIFORNIA – Today is officially the first day of summer – and already, that statement holds a very powerful connotation. It’s a proclamation that instantly invites a rush of nostalgia of youth, gratitude for the present moment, and feelings of optimism for the coming months. It’s also a hell of a time to party. Day parties are popping up all over dance music spaces in our bustling beach town, but The Deep End has a special event planned that takes us back to our summer roots: the beloved block party. 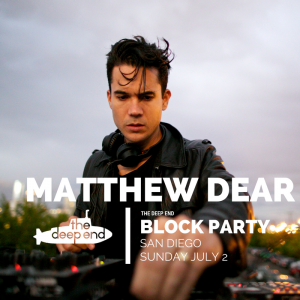 The Deep End Block Party, happening on none other than Independence Day weekend, combines the nostalgic feels of your local neighborhood block party with a festival-style production of artists and collaborators. With an entire block shut down near San Diego Harbor, the sweeping urban landscape allows room for two stages of music, all mediums of live art, handpicked food truck fare, cultivated vendors, ice cream trucks and all. Taking place Sunday, July 2nd from 2PM – 10PM, eight hours of dance music will color the gathering of San Diego’s creative crowd. 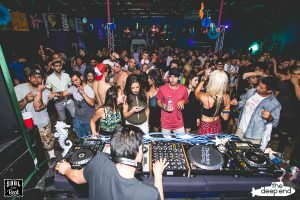 Known for their popular underground events and co-producing the recent West Coast Weekender festival, The Deep End attracts the folks who embrace the alternative art scene, the underground music, and other local involvement. As the sun sets, you can expect a memorable view of the San Diego Bay and the downtown skyline as planes from the airport buzz overhead. A custom visual presentation will light up the stages and become more pronounced upon nightfall, paired with killer music. 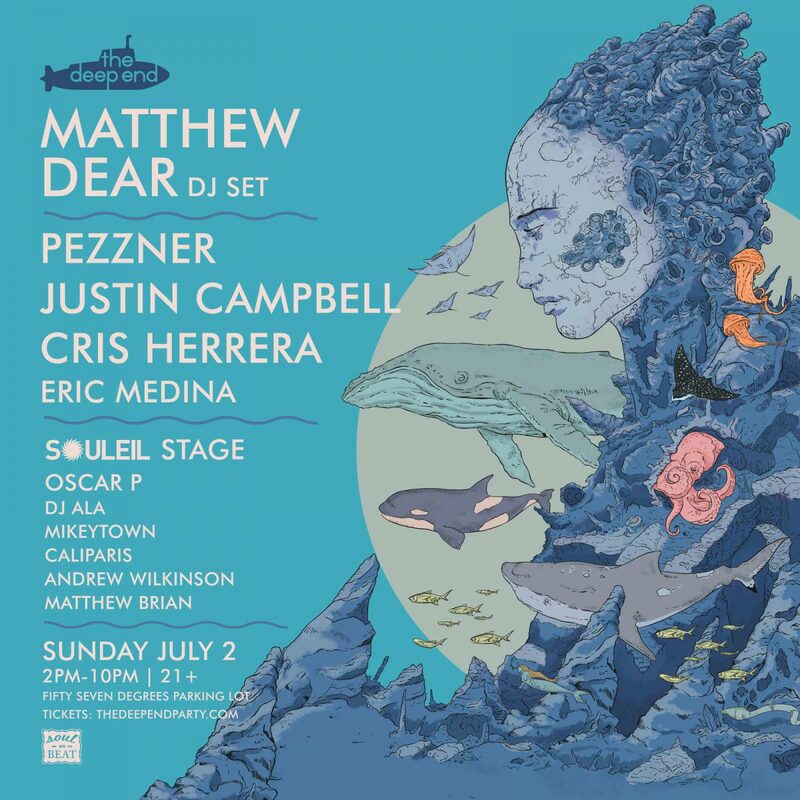 DJ Matthew Dear headlines the lineup with a highly anticipated set, known for his many unpredictable and exciting projects. With 15 years of released music, the Detroit native is well respected in the underground scene. His “face melting techno” as moniker Jabberjaw, “dark avant-pop” as his own name, and “intricate minimal” Audion shows off his musical range, and makes us giddy to hear his DJ set for the block party. 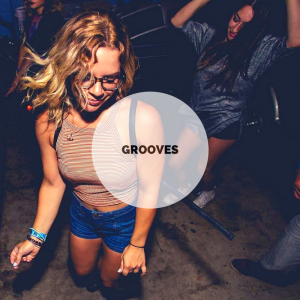 Dear’s music not only gets us dancing, but it invokes some deep, moody feeling as well. Pezzner also highlights the bill, known for everything from trippy house beats on Dirtybird’s label, spacey techno on Subtract Music, disco dance tracks, but unconfined to any one style. In other words, both Pezzner and Dear may contribute a hefty block of dark yet uplifting sounds under the summer night – a very fitting pair to complement each other. Other DJs playing the mainstage are Justin Campbell, Cris Herrera, and Eric Medina. The Souleil stage is led by Oscar P, Miketown, DJ Ala, Matthew Brian, Andrew Wilkinson, and CaliParis. Remember – it’s not your average block party, so expect a full turbo sound system by Siesta Soundsystem, and visuals / stage design by Lobstervision, JRoy A/V. There is always something really dope about the mist of dusk blending with the glow of colorful lights, as the beat goes on. In 2016, The Deep End vowed to incorporate more art into each musical event. “Making it about the underground with art has been our main focus,” organizers announced at the beginning of the Fall season. 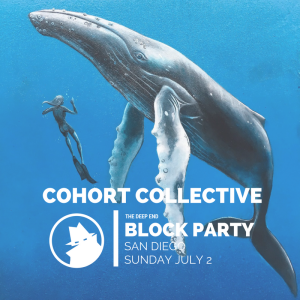 Some of these talented San Diego creators that The Deep End looks forward to hosting are live muralists from Cohort Collective, artists Chris Konecki and Carly Ealey. “You’ve seen their work all over the city and beyond,” The Deep End writes on their event page, going off the block party’s theme of involving the local scene. Other surprises are in store for attendees – a pop up photo gallery with 4 local city photographers will be exclusive to this event. 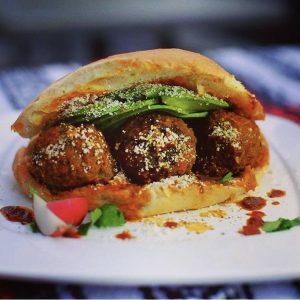 Speaking of local vibes, what good is our city without its bomb food? Fresh out the oven comes Dang Brother Pizza, off the food truck comes Corazon de Torta, and in the freezer is King Kream – not your average ice cream truck. A full bar will be provided, allowing us to roam freely with drinks throughout the entire block. Local vendors will bring their best and brightest creations, like the popular wood-etched designs from LaserTrees; clothing, accessories, pendants and the like. More food, vendors, and collaborators may be announced, so connect with the Facebook event to receive updates – all information and links are listed below. Ticket prices are rising fast for this July 4th weekend event, so review the following options. Hard Tickets – $20 at El Comal Restaurant in North Park. All sales final. No ins & outs. Rain or shine event. Music and art for the underground.